Vacations are wonderful! Psychologists and performance coaches recommend taking a break from the daily grind to rest and recuperate. However, for all the work a human gut does, does it not deserve a break as well? Each and every bit of food ingested by an individual must go through the rigorous and well-defined process of the body breaking the food down into usable nutrients, absorbing these nutrients, and ultimately excreting out the waste products for which the body has little to no use. Challenges arise when any of the steps in the digestive process begin to lose efficiency and the body is forced to deal with the sequela of the disturbance. Bacteria can be translocated or overgrown in various parts of the small bowel. The clinical manifestations of this can range from an annoyance to small intestinal bacterial overgrowth (SIBO). Moderate to severe gastrointestinal (GI) dysfunction – including SIBO, IB and Crohn’s, requires medically supervised intervention. Other moderate to severe GI dysfunction may be affected by the loss of efficient digestion.1 As this occurs, the concept of “gut rest” for the distal GI tract is important to support the healthy balance of bacteria. Cases typically managed by gastroenterologists also have a dietary management component. Part of the dietary management is to allow the gut to heal by removing interferences to healing as well as simply adding the tincture of time without excessive work. Fasting is an example of gut rest, but unfortunately, it also starves the body of both micronutrient and macronutrients. Significant support of the delicate gastrointestinal function and environment is provided when using the elemental diet and ensuring adequate calories, vitamins, minerals and nutrients are provided. Gut rest can be a useful option for many people and can be achieved with excellent results through its efficient application in combination with an elemental diet. 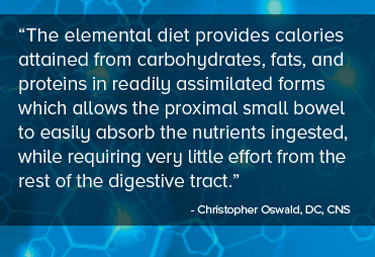 Gut rest and the elemental diet are not for everyone, but for those with moderate-to-severe gastrointestinal dysfunction, it should be an option given serious consideration, and used under close medical supervision. The elemental diet carries a high level of efficiency and effectiveness in maintaining gut health, which also requires a high level of responsibility. Patients should always consult their healthcare practitioner for guidance in determining what option will best fit their needs and should not begin use of an elemental diet without the help of a qualified healthcare practitioner. Müller MJ, Schmidt LU, Körber J, et al. Reduced metabolic efficiency in patients with Crohn's disease. Dig Dis Sci. 1993 Nov;38(11):2001-9. Rezaie A, Pimentel M, Rao SS. How to Test and Treat Small Intestinal Bacterial Overgrowth: an Evidence-Based Approach. Curr Gastroenterol Rep. 2016;18(2):1-11. Russel RI. Elemental diets. Gut. 1975;16(1):68-79.